RLSC owns and operates three state-of-the-art grooming tractors with trail drags utilized to groom a flawless trails network. Our regional trail system boasts one of the largest organized clubs out of 281 in the State of Maine. Our club draws from a solid group of volunteers and paid groomer operators to keep our trail system unmatched in New England. These professionals have refined trail grooming into an art. The typical snowmobile trail is approximately 16 feet wide and manicured to perfection. Our trails are straight and fast. Trails get groomed late at night, allowing them to freeze to a smooth, solid hard-pack. Grooming late at night allows time for the trail to "set up" and this keeps the trail flatter for a longer period of time. Also, grooming at night is much safer for riders. Meeting a groomer on a corner on the trail in the daytime is very dangerous. The lighting on the groomers at night alert riders that a machine is heading in their direction. The Maine Snowmobile Association inspected our trails and the reports that came back were very good to excellent. Thank you to District Trailmasters and our grooming people for your hard work and dedication. Please stay off logging roads. Even if roads are not plowed, logging companies still utilize the roads until they are impassable. Snowmobiling on logging roads is EXTREMELY dangerous! Log trucks CAN NOT get out of the way or stop quickly. Continued snowmobiling on these roads could cause a trail closure. Please don't jeopardize our trail system! 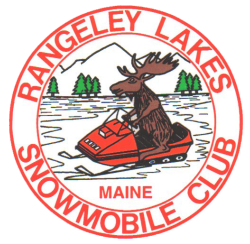 Snowmobiles are NOT allowed to ride on any sidewalks in Rangeley. Not only is it unsafe, it is illegal and you will be fined.